From being forgotten by the State to the Overlook Park masterplan to Bayfront Beautification Project, the history and status of what's becoming known as "Billboard Alley"
The Erie Bluffs, a slender ribbon of undeveloped land between the Bayfront Parkway and the rest of the city, has been a problem since 1795 when our region became a part of Pennsylvania. This land's small footprint belies its large presence as a barrier between the city and the water's edge that keeps citizens from easily accessing the sparkling waters of Presque Isle Bay. And now, since 2011, with the Erie Community Foundation's licensing agreement with the Port Authority and the current Bayfront Beautification Project, this 23-acre no-man's land continues to see its share of trouble. With the overgrown and invasive vegetation removal nearly complete, and sponsor logos and small gardens installed, critics call it an eyesore or worse, and champions call it a work in progress. One thing both detractors and proponents agree on, though: Something had to be done with the prominent overgrown bluffs that are the city's "front door." To understand how the bluffs (and the community) got to where they are today, we need a quick history lesson. When the borough of Erie was established in 1805, the Commonwealth of Pennsylvania retained title to this property, which stretches from Cascade Street on the west and Wallace Street on the east. No one knows why. The land was untouchable by the city, development-wise. Citizens, working alone or in small, independent groups created ad-hoc paths and put in a few benches, but mostly no one cared for the parcel because no one local owned it. The state forgot about it, only paying attention when granting easements to the railroad or a company wishing to do business at the waterfront, and it allowed the Erie Extension Canal to link up to the West Basin. The two-mile stretch quickly became an industrial corridor where trains and trucks went about their business and people dumped their unwanted trash. By the year 2000, it was a bank overgrown with invasive plants and laden with junk that looked shabby next to the new Bayfront Parkway that was being built in the 1990s, and the and developments north of it. The Erie-Western Pennsylvania Port Authority finally acquired the land in 2002 as part of a site master plan — created with community input — for the development of "Overlook Park." This comprehensive forty-page plan outlines the challenges and lays out a plan for open spaces, habitat reclamation or improvement, pedestrian walkways, security, and more. Its estimated price tag in 2002 was $12,122,600. As far as can be told, only a handful of people remember that this plan was created and it is not available online for public viewing. It is, however, still the plan that the Port Authority is using to move forward with any development on the property. What does this have to do with the clearing of trees and the sprouting of corporate logos? The Overlook Park plan never found funding. 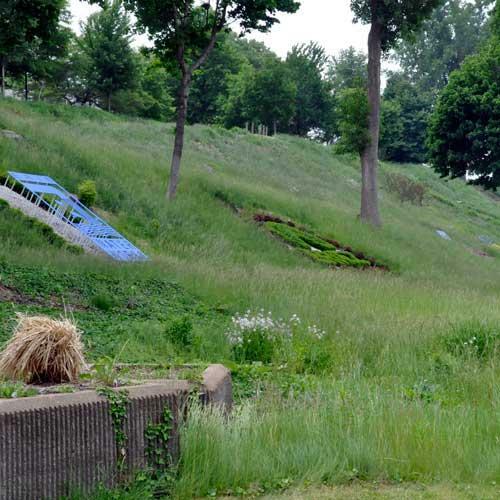 Nine years later, in 2011, the Erie Community Foundation (ECF), with a generous $75,000 gift, kick-started the effort to move the land from unkempt bank to public park. The Foundation came to a five-year licensing agreement with the Port Authority to oversee the "Bayfront Beautification Project," giving it the right to make decisions about the property. The ECF then turned to the business and nonprofit community for additional funding, and started soliciting sponsorships from local businesses and civic organizations. For-profit organizations were asked by the ECF for $50,000 sponsorships and nonprofits, $25,000. In return, these businesses and institutions receive recognition through their logo signs and a surrounding garden, with maintenance, for a five-year period. Afterwards, the sponsors can choose to re-up for a pro-rated share of the overall maintenance costs, which Mike Batchelor, executive director of the Erie Community Foundation, says would be approximately $6,000 per year. The ECF plans to complete its project at the end of the five-year agreement, which Batchelor says will be in one or two years, and any future development will be back in the hands of the Port Authority. According to the Erie Community Foundation's website, its part in the larger plan is a multi-year process in three phases, with the bulk of the initial cash going towards clearing the sites between Cascade Street to Myrtle Street (with the exception of some privately-held properties), and Holland Street to Parade Street. The third phase is listed as "creating bayfront access down the hillside directly across from Liberty Park including a safe walkway across the Parkway into Liberty Park." Both phase one and two, the clearing of the west and east side, was completed in 2013. There is no timeframe indicated for the third phase, but currently a path from Cascade and around the corner towards Liberty is being cleared with Port Authority funds along with some matching monies from the ECF. Raymond Schreckengost, executive director of the Port Authority, says that the crosswalk to Liberty Park will be completed this summer. The clearing of the bluffs was instrumental to getting the project off the ground and is the first step in the Overlook Park master plan, since so many invasive plants, such as ailanthus (tree of heaven), phragmite (common reed), and Polygonum (Japanese knotweed) had populated the site. Removing the debris and invasive plants was expensive work. The Overlook Park plan calls for the sparing of areas that contain native species and maintaining areas for wildlife, but doing so was cost-prohibitive says Dan Dahlkemper, landscape architect and consultant to the ECF on the Bayfront Project. "I would love to see native plantings or wildflowers, but they are difficult to control," says Dahlkemper, "We started with so many invasives; until we can get those under control, I am looking to use native trees and grasses in the design that are easier to maintain and still create a park-like setting." This is where the voice of the opposition gets a little louder. Susan A. Smith, a member of the Presque Isle Advisory Board, and on the boards of the Lake Erie Region Conservancy (LERC) and Tamarack Wildlife Rehabilitation Center as well as a life-long nature and wildlife advocate, disagrees. "The worst part is the way the bluff was savaged to look like it had been bombed and that nothing has been done to restore the natural habitats," she says. Chris Magoc, Chair of the History Department and Director of the Public History program at Mercyhurst University, agrees. "I was not directly involved in this project, so perhaps I am wrong, but from the outside, it seems to me that far more trees and vegetation were stripped away than necessary, doing damage to prime habitat for birdlife and other animals that inhabit the water's edge." Tom Fuhrman of LERC echoes their concern. "I wish all the logos were created like Sunburst Electronics' was — out of living shrubbery, in a green manner. They don't seem to have any consideration for wildlife in their plans. When it was first cut in 2011, LERC received lots of calls from citizens reporting animals moving up into the neighborhoods on the lower west side." Despite their criticisms, Smith, Magoc, and Fuhrman are supportive of the project and want to contribute to it. Another point of contention is the installation of the logos on the bluffs. In their "Considering the City" editorial in the Erie Reader March 5, Civitas points out that, according to zoning laws, advertising on the Bayfront is prohibited and people see the signs as just that – advertising. John Vanco, executive director of the Erie Art Museum, is disappointed in the results and sees the signs as mere marketing. "The logos show no understanding of good design and seem to me to be erected far too early in the project. Shouldn't the work be done before the sponsors get recognition?" he asks. Magoc says the signs "cheapen what is a public space." Batchelor supports the signage, saying that it is not about marketing but showcasing the region's assets. "We can show anyone who comes here that we have thriving businesses and four educational institutions that make this a better community." He also added that as part of the agreement with the Port Authority, who retained ownership of the property under the licensing agreement, the ECF has permission to use the space in this way. Dave Brennan, a member of Erie City Council, thinks that there should be more landscaping and the signage could be smaller, but overall, he supports the project. He expressed some concern, however, for how the project is moving forward. "I'm relatively new on Council, so I am still catching up on the details, but I think we need more public input – see the complete vision the organizers have in mind. We really haven't seen that." And there's the "trouble" in a nutshell. Many members of the community feel that they have not had a chance to contribute, despite the fact that five public meetings were held for the Port Authority's Overlook Park plan in 2001 and two before the ECF's Bayfront Beautification Project moved forward in 2011. Schreckengost feels that if people wanted input, they should have been a part of the process when the public meetings were held. Many who are now voicing their concerns, however, were part of the Overlook Park planning process. Vanco, who was a member of the planning committee for the Overlook park plan, says at the time it "did not include the mounting of large corporate logos on the bluffs. Yes, public-private partnership is needed, but this isn't the way to go about that." One can surmise that nine years of inactivity since the creation of the Overlook Park Plan is serving to confuse and surprise people; after all, public memories can be short lived. But the ECF is taking some heat from critics for their handling of the more recent project. Vanco also attended one of the two public meetings that the ECF held in 2011, where he asked to see concrete plans and a budget. "I found out later that people were unhappy that I was asking those questions," he says, adding, "nothing changed as a result of my input." Magoc feels "this project has thus far proceeded without the sort of genuine engagement with important constituencies of this community who might well have been able to collaborate in helping to produce a more thoughtful design of greater sensitivity to a range of issues." Batchelor maintains that their planning "was not hatched in secret. We held public meetings for input. This will take years to develop; people need to be patient." Schreckengost adds, "for those one or two people who don't like what's being done, there are 100 who do. We aren't going to please everyone." But many are still unsettled and feeling disenfranchised and several questions linger. Should the Erie Community Foundation have held more meetings or collaborated more broadly? Should the ECF or the Port Authority have conducted more outreach on the need for removal of invasive species to prevent negative public perception? Will all we end up with is a long bank of grass, some trees, and more metal logos sprouting up? And the biggest question of all may be: When the ECF steps away in one or two years, then what? The answer to that question, as far as funding is concerned, may be making its way through the Pennsylvania Senate. Senate Bill 968, sponsored by Sen. Randy Vulakovich (R-40) and co-sponsored by Sen. Sean Wiley (D-49), promotes a Waterfront Development Tax Credit program that would allow private enterprise to receive a tax credit for any donation made to an eligible organization that is developing a waterfront property for public use. This would be similar in structure to the current Educational Improvement Tax Credit program. The bill was referred to the Appropriations Committee in January. If passed into law, a more regular funding stream may be possible. But is the Overlook Park envisioned in 2001 still viable? Hasn't the Bayfront and the community changed since then? Certainly our perception of it has. Is it time to revisit, and, perhaps, freshen the Overlook Park plan? Now that the work has begun and the community is engaged, we stand at a threshold of opportunity. Could this be the moment we do it right and do it well?